By now, most of us have heard about the murder of three Muslim students at the University of North Carolina, which was followed shortly by Craig Hicks turning himself in for the murders. More relevant to the atheist community is that Craig was an atheist; moreover, he was an anti-theist. The fact that this victims were Muslims and that Craig had posted publicly statements regarding Islam is a fact with inescapable implications – were these three murdered for being Muslims? A popular explanation for the murder was a parking dispute, though the father of one of the victims has described this as the conclusion of an ongoing history of conflict between Hicks and his victims. Whether or not the investigation bears out that it really was a parking a dispute that led to the murder of three students is not what I want to focus this post on. 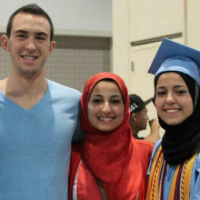 The murder of these three students and the suspected motive of their religion or their race (or a combination of both) being what led to their murders reflects a problem that much of American society has: a xenophobic intolerance of Muslims, be they American or non-American. If you haven’t ever heard or read of this happening, it’s not hard to find reliable accounts of this phenomenon. As a good starting point, I’d advise you check out Heina Dadhaboy’s blog for a couple of accounts. The fact that there are many who are championing the parking dispute as a motive and not only failing to discuss religion or race as a possible motive, but foregoing the conversation altogether of the problem that American society (and, being a subset of it, American atheist communities) has with racism and xenophobia against Muslims should be disconcerting. Much as we might otherwise want, being an atheist does not imbue us with a transcendent wisdom that allows us to unshackle ourselves from the negative heirlooms of our culture. We have to be willing to address these problems and work to resolve them within our own communities if we really are working to create a safe, positive community for atheists. I want to make it clear that KCAC works to create that safe, positive community. We do not suppress criticisms of Islam for its use in propagating harmful ideas, but, at the same time, we also wholeheartedly promote the basic dignity and respect that individuals, Muslim or otherwise, deserve. Pursuant to that, we stress that one cannot be held responsible or even be assessed by the actions and words of people who share the same religious identity. Anti-Muslim bigotry, and bigotry against people who are perceived as being Muslim, is a problem in our society that we recognize and work to discourage. 2 Comments to "Chapel Hill and the Atheist Community"
Well written Josh. I couldn’t agree more. The irony of the situation is that, logically, atheists and Muslims should be allies in denouncing discrimination based on religious opinion. At least Muslims don’t have to contend with such blatant and official bigotry as is enshrined against atheism in Article VI, Section 8 of the North Carolina state constitution, where atheism is equated with treason and felony in making one unsuited for public trust.